Built in 1846 of hand-hewn timbers and hand-made nails. 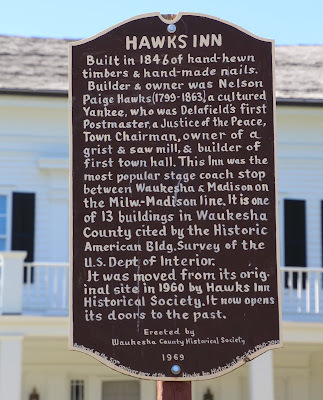 Builder & owner was Nelson Paige Hawks (1799-1863), a cultured Yankee, who was Delafield’s first Postmaster, a Justice of the Peace, Town Chairman, owner of a grist & saw mill, & builder of first town hall. This Inn was the most popular stage coach stop between Waukesha & Madison on the Milw.-Madison line. It is one of 13 buildings in Waukesha County cited by the Historic American Bldg. Survey of the U.S. Dept. of Interior. 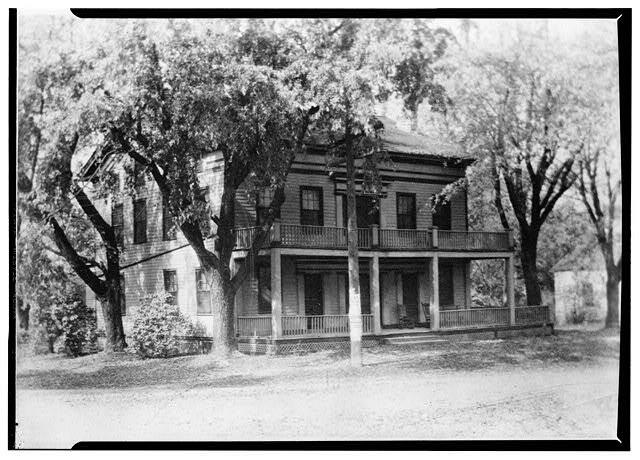 It was moved from its original site in 1960 by Hawks Inn Historical Society. It now opens its doors to the past. 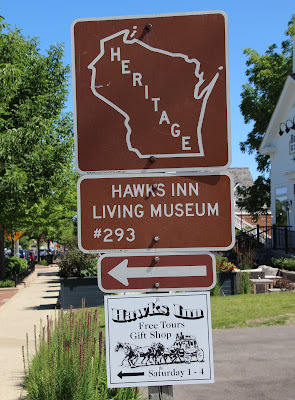 Hawks Inn is located on eastbound Wells Street, between Main Street (to the west) Genesee Street (to the east), at 426 Wells Street, Delafield, Wisconsin 53018. 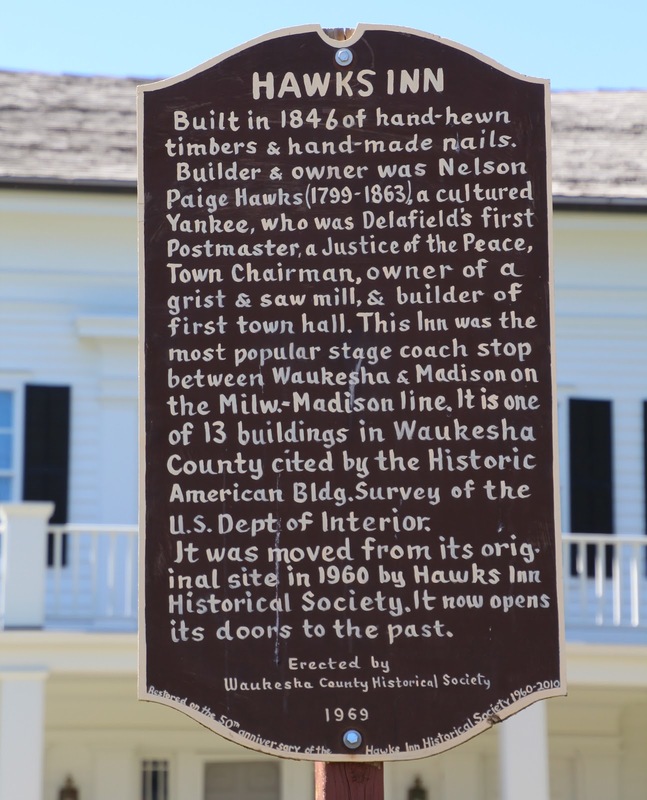 A lovely, in-depth article on the restoration of Hawks Inn. 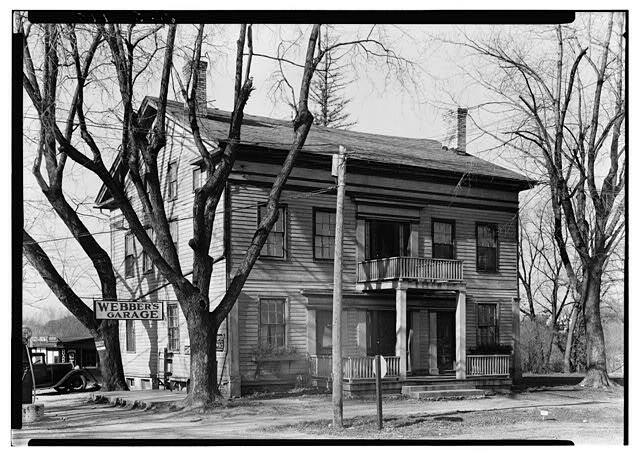 The property is listed (as of February 23, 1972) on the National Register of Historic Places: Wisconsin. This marker is No. 05-02 in a series of historical markers erected by the Waukesha County Historical Society. The medallion is to the left of the front entrance. The building is three stories high and is in fair state of preservation. It stands on its original location and remains intact, except for the front porch which has been removed and a smaller one built in its place. The foundation walls are of field stone and the rest of the structure is wood including the roof. Very little, if anything, can be added to the above account of this structure. It's fame as a hostelry of the stage-coach days of Wisconsin revolves chiefly around the genial character of Haks, the proprietor. Henry Ellsworth Cole, in his recollections of "Stage Coach and Tavern Tales of the Old Northwest," dwells at length on this Tavern, but the story centers entirely around the host, which is of little interest here. The above information was obtained from Miss Caroline Brewster, a descendant of the original owner. NOTE: Stage Coach and Tavern Tales of the Old Northwest, by Henry Ellsworth Cole, is available for purchase on Amazon! The adjoining history center . . .
Heritage Sign leading to the location of Hawks Inn. Hawk's Inn is located in Delafield, Wisconsin.